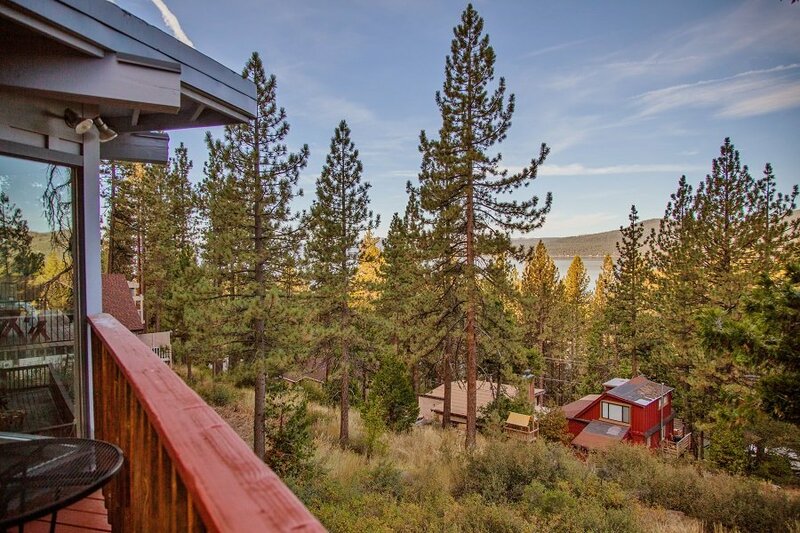 Brockway Lakeview is a quaint 3 bedroom home to enjoy a Tahoe Getaway with panoramic Lakeviews. The property is conveniently located to Kings Beach shopping and restaurants. Also, only a few minutes away are the North Shore casinos and night life. In the winter months you are in a perfect place to enjoy Northstar and in the summer you have quick and easy access to the sandy shores around the Kings Beach area. The Brockway Lakeview home captures the essence of the beauty of Tahoe from the comforts of the living room. This hillside property not only has sweeping lake views, but it also is conveniently located near the lake for access to the beautiful sandy beach, shops in Kings Beach, ski resorts, casinos, and countless outdoor activities. This home is perfect for the ideal Tahoe getaway with family and friends! The open living area layout is perfect for socializing with the group, or for a quiet romantic night soaking up the view of Lake Tahoe. When you walk in the front door, you are greeted with a spacious living area with floor to ceiling windows showing off the amazing lake view and wilderness of the Tahoe Basin. The kitchen is a generous size, allowing for plenty of room to cook your favorite meals. The open layout to the living areas allows you to prepare food while not being left out of the action. The living area is then broken up into three different areas. The first space is furnished with a comfy couch and a flat screen TV to enjoy your favorite shows or movies. Next to that is another couch facing the opposite direction and allowing for the perfect place for taking in the view and curling up in front of the fireplace. The living area also has a dining area to enjoy meals with family and friends. Plus, there is an outdoor extension to the living area on a corner deck with seating and a grill to enjoy a nice summer night or a warm winter day. The lower level of the property houses most of the sleeping area and another full bathroom. The master bedroom is very spacious. There is an area to sleep as well as a seating area that takes advantage of the hillside views. The other bedroom downstairs has two single beds, which is perfect as a kid's room or putting the beds together would make for a large king size bed. This room has access to the back yard and lightly wooded area with a small landing outside of the door. 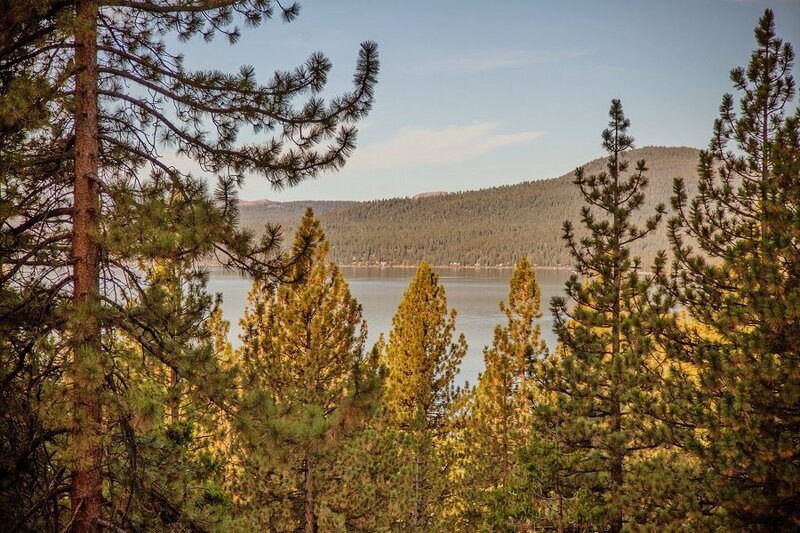 This property is nearby a multitude of Tahoe activities. It is located less than a mile to the border of Nevada where Crystal Bay houses the North Shore casinos, where you can do some gaming or take in a show. Less than a mile in the opposite direction, you will find there are restaurants and shops to browse in Kings Beach. Not only can you find unique little shops throughout Kings Beach, but there is also the convenience of a full-sized grocery store. This area is great for summer and winter. In the summertime, you can enjoy one of Lake Tahoe's most popular beaches that offer picnicking, bathrooms and volleyball among other activities. This area is also a great access point to lake water sports, with numerous summer activity rental shops along the road. Kings Beach also has a conveniently located golf course and for variety, Incline Village is only a short drive away, with more golf courses, shops, and dining locations. This spot is ideal for downhill winter sports at Mt. Rose or Northstar, or sledding at the North Tahoe Regional Park. This is a great location to have access to the family-friendly and activity-packed Northstar Resort. The Village at Northstar has something for everyone year round. In the winter months, you can ice skate, ski, snowboard, snowshoe, plus even more at the village. In the summertime, you can hike, bike, or golf right in the same area. Year round you can shop, dine, check out the spas, or catch a movie. This location really does have something for everyone and boasts an equal amount of convenience coupled with Tahoe charm. This home located in Kings Beach (Northern Tahoe) was the PERFECT location to celebrate the Thanksgiving holiday. The views from the "Window Wall" was ever-changing as the weather changed... We had everything we needed and for things we did not have a Safeway was only a few blocks away. Plenty of restaurants close by...Our favorite "Lanza's Italian Restaurant" right next to Safeway. The California/Nevada state line is just down the block along with several casinos. We shared the home with our daughter and her family and they were able to have the whole down-stairs to themselves while we stayed upstairs in a bedroom and our son slept on the couch. I am handicapped and it was a very easy walk into the house and I only went down stairs once to see it. Thank you so very much VRBO and the owners of this Beautiful Home for allowing us the privilege of spending a wonderful week in your home.